The evolution of structural properties, thermodynamics and averaged (dynamic) total hardness values as a function of the composition of binary water–organic solvents, was rationalized in view of the intermolecular interactions. 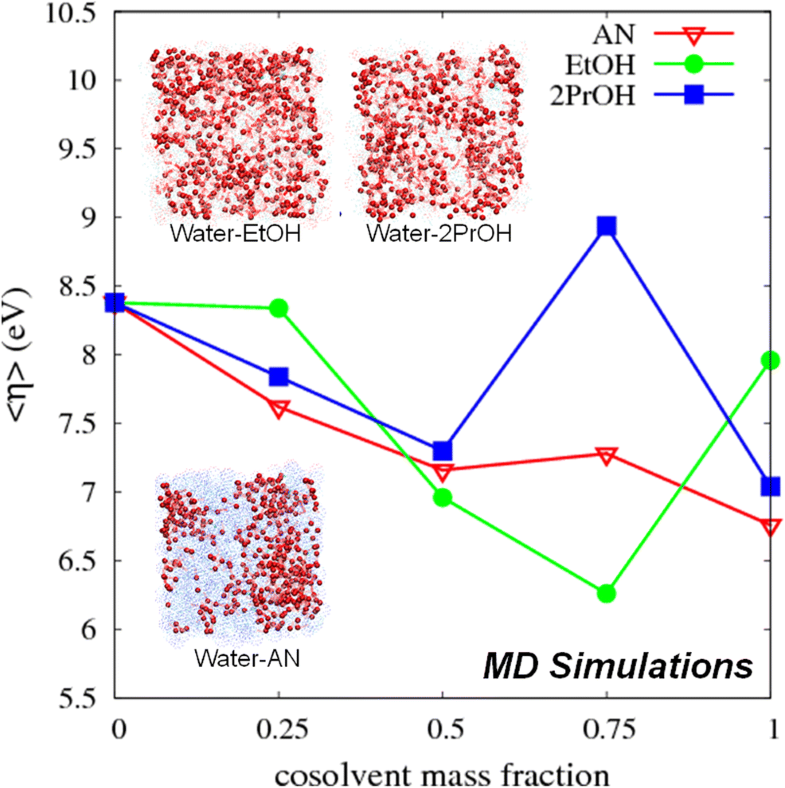 The organic solvents considered were ethanol, acetonitrile, and isopropanol at 0.25, 0.5, 0.75, and 1 mass fractions, and the results were obtained using molecular dynamics simulations. The site-to-site radial distribution functions reveal a well-defined peak for the first coordination shell in all solvents. A characteristic peak of the second coordination shell exists in aqueous mixtures of acetonitrile, whereas in the water–alcohol solvents, a second peak develops with the increase in alcohol content. 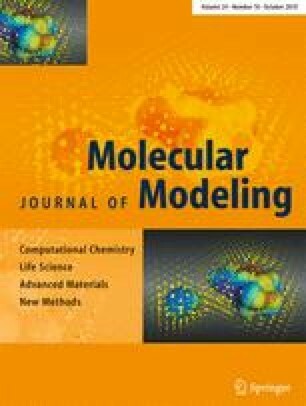 From the computed coordination numbers, averaged hydrogen bonds and their lifetimes, we found that water mixed with acetonitrile largely preserves its structural features and promotes the acetonitrile structuring. Both the water and alcohol structures in their mixtures are disturbed and form hydrogen bonds between molecules of different kinds. The dynamic hardness values are obtained as the average over the total hardness values of 1200 snapshots per solvent type, extracted from the equilibrium dynamics. The dynamic hardness profile has a non-linear evolution with the liquid compositions, similarly to the thermodynamic properties of these non-ideal solvents. The online version of this article ( https://doi.org/10.1007/s00894-018-3817-2) contains supplementary material, which is available to authorized users. This work was granted access to the HPC resources of [CCRT/CINES/IDRIS] under the allocation 2017 [×2017087369] made by GENCI (Grand Equipement National de Calcul Intensif] and was partially funded through the ENSCM SINCHEM EMJD PhD grant. SINCHEM is a Joint Doctorate programme selected under the Erasmus Mundus Action 1 Programme (FPA 2013-0037).